Journey of the Internet Explorer started in 2001. During 2002 and 2003 IE6 captured 90% usage share. After 8 years IE6’s usage share is around 14% (as per W3Counter Global Web Stats August 2009). Why does IE6 market share dropped so far? That means IE6 failed to be with going trend. Today situation of IE6 is like Dinosaur. So, how does people around the world reacting on IE6’s failure? By running different web-based campaign. 1. The first such a campaign I encountered is .net Magazine’s “Bring Down IE6”. Craig Grannell of Bring Down IE6 movement asked designers and developers to unite “to take IE6 behind the shed and shoot it”. Article ‘Calling time on IE6’ is showing strong reasons to call off the IE6 usage forever and urging you and me to educate our colleagues, users and clients about calling time on IE6. On August 15th, 2008 October 1, 2008 we will begin phasing out support for Internet Explorer 6 across all 37signals products. In order to continue using the products without any hiccups, Internet Explorer 6 users should upgrade to a newer browser. Apple says ‘no’ (well, upgrade) to IE6 users if they want to use MobileMe. One of leading WordPress premium theme club WooThemes has announced, “We’re considering dropping support of IE6 on our new themes”. 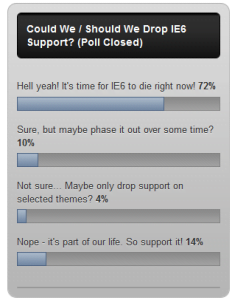 The site also conducted a vote, that gathered 72% vote for It’s time for IE6 to die right now. 2. “The Browser for the Better Campaign“, a campaign run by Microsoft is another indication that the giant itself want that the IE user should upgrade to latest one. 3. “IE6 No More” is another such a site providing different language code to show a custom message whenever your site is browsed by IE6. 4. “Shockingly Big IE6 Warning“ is a plug-in for WordPress user that shows a warning message alerting the user why it is bad to use IE6, the security risk and the bad compatibility of Web Standards. 5. 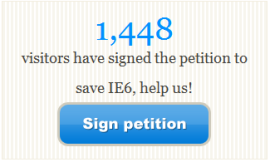 Beside the above bring down IE6 movement, SaveIE6.com is moving towards to save IE6 and asking signed petition, showing different reasons and graphical data such as Browser comparison table, reasons why you should use IE6, etc. Amazingly the site gathered good number (1,448) of petition.